Image courtesy of Harvest Seasonal Kitchen. Just over two years after first opening its doors, Harvest Seasonal Kitchen has begun brewing beer in house at its location on the square in Historic Downtown McKinney. Harvest, owned by Don Day and Rick Wells of Rick's Chophouse at the city's Grand Hotel, debuted in September 2014. Billed as a farm-to-table restaurant with a Texas flair, Harvest's primary mission has since been to promote community agriculture and sustainability. That approach will guide the newly-instituted brewing operations as well, which will be overseen by general manager and resident brewmaster Toby Thomason. "Our goal is to make farmhouse-style ales, brewed in the Belgian tradition, utilizing local ingredients and sustainable practices," says Thomason. "When it came to beer and how we run our beverage program, it just makes sense. We have plenty of farmers to provide us with different grains for brewing, and plenty of farmers who will take our spent grains." One of the project's ambitions is a prime example of how the restaurant intends to apply its local focus to making beer, as Harvest hopes to one day produce a naturally-fermented cask-aged ale made with all Texas ingredients. 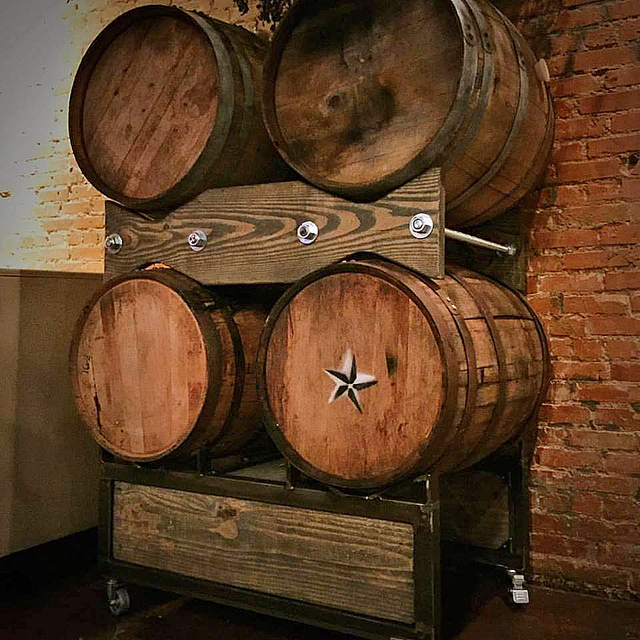 "Right now we are sourcing malt from Blacklands Malt in Leander, and the barrels we are using are from local wineries and distilleries. The hops are being grown at our farm, Water Boy Farms in Lucas, which yields very little, but eventually the crop will give us enough to make an all-Texas farmhouse ale." as well as a variety of naturally-fermented cask ales (Image credit: Harvest Seasonal Kitchen). Sourcing local will also involve fermenting with naturally-occurring yeast strains, which along with the use of varying seasonal ingredients suggests patrons can expect to experience something different each time they step through the restaurant's door. "We are brewing on a small-batch system, with a maximum output of 50 gallons," says Thomason. "Doing small batches will allow us to experiment with blends and aggressive yeast strains that we otherwise would not be able to use. Over time, we will develop standard recipes, but for the most part we are going to let the native yeast strains take over. On top of that, we plan to use whatever ingredients are in season, both on our organic farm and from other farmers in the area, to create something we feel is unique." Along those lines, a few of the beers currently in development at Harvest include a honey and juniper ale (brewed with honey from the farm), and a sour IPA that will rest in tequila barrels prior to being reactivated with prickly pear. Up first, though, will be a beer named for James Webb Throckmorton, a former Texas governor and U.S. Congressman. Old Leathercoat, which recalls a nickname given to Throckmorton by Indians he negotiated with on the frontier, is a barrel-aged porter set to be refermented with orange peel and Luxardo cherries. As for when Old Leathercoat will available, it's all a matter of maturation, so keep an eye on the restaurant's Facebook page for updates as to when the first batch will be released. In addition, stay tuned for details on collaborations Harvest has in the works with its McKinney counterparts, Franconia Brewing Co. and Tupps Brewery.